Q: Will Blooper Eel make me a more successful businessman / businesswoman? Q: I’m not a businessman/woman, why in gods name do i need a “Blooper Eel”? Well start off by flipping the board upside down and mounting these two LDRs in the middle as shown. These will be pretty hard to solder in place later as you will see. Simply push the legs through the holes, and then bend the legs apart so that they dont fall out when you turn the board back over again. 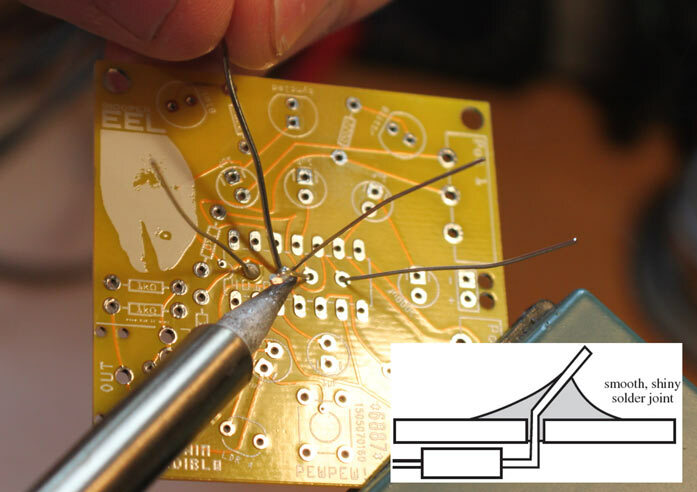 If you have never soldered before there are plenty of beginners guides to find online but this pictures sums it up nicely. 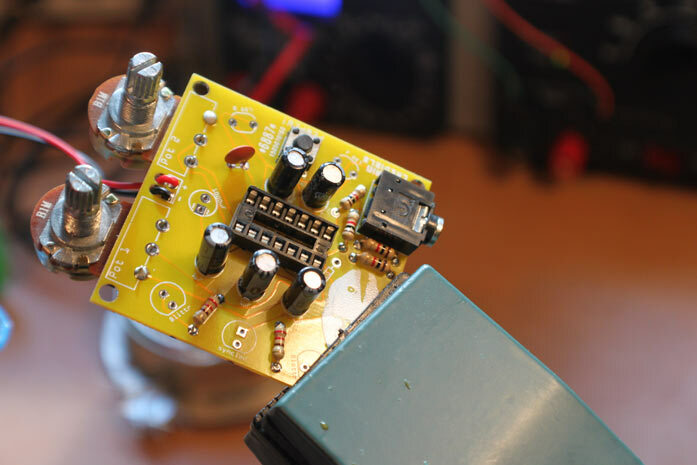 Use the soldering iron to heat up both the LDRs leg and the metal solder pad around the hole. then apply the solder to the point where they all meet. 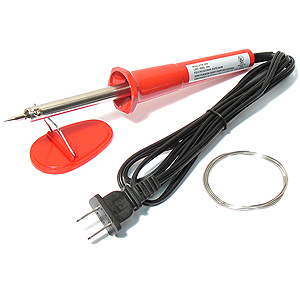 if the solder wont melt at first, touch it against the tip of the soldering iron to get it going. Now use a pair of wire clippers to clip the rest of the legs off. try to cut the legs as short as possible, we need to fit the IC on top. The IC socket slots into its place from the top og the board, so that the legs peep out on either side of the LDRs. the PCB. 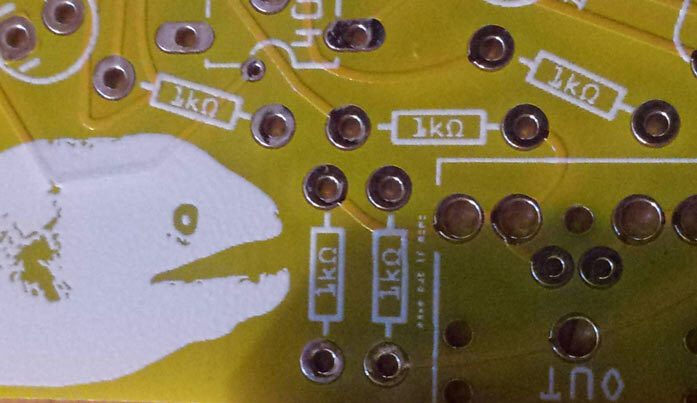 If you use too much solder you might accidentallymake a blob that covers two legs. These legs then become connected together (shortcircuited), wich is bad. 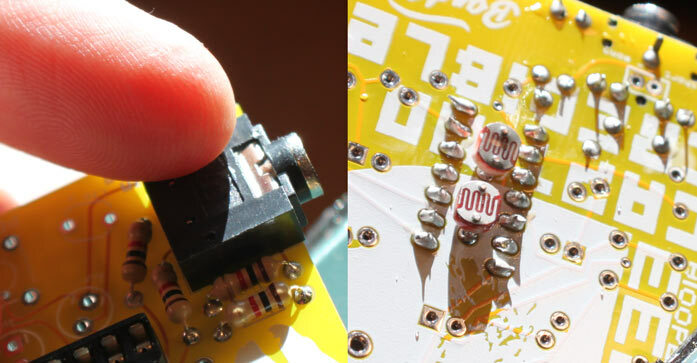 If this happens, clean the tip of your soldering iron and then pull it between the two legs that are shorted. Some solder will come off the legs and stick to the soldering iron. 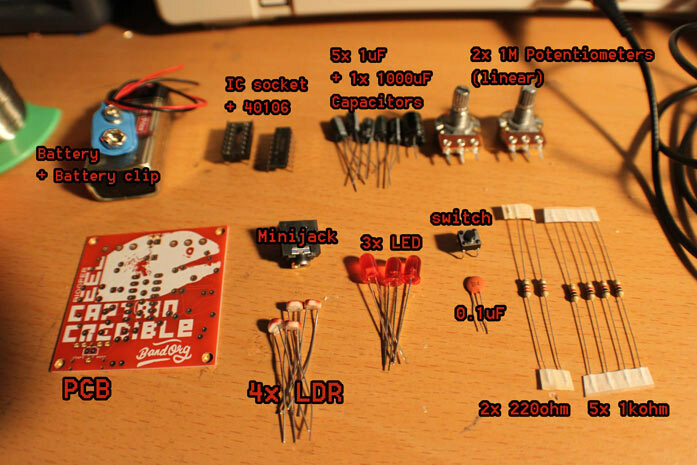 repeat this process until the soldering looks good. oh and in case you where wondering, it doesnt matter what way round resistors go. This plops in amidst the resistors we just soldered. i bent the top pin up a bit so that the minijack socket wouldn’t fall out when i flipped the board over. Then solder as usual. 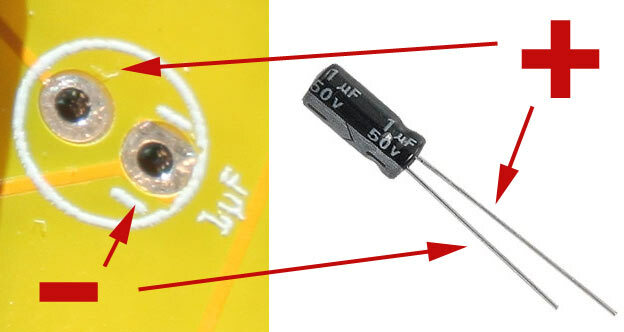 These are easy to identify as they have 1uF printed on the side. 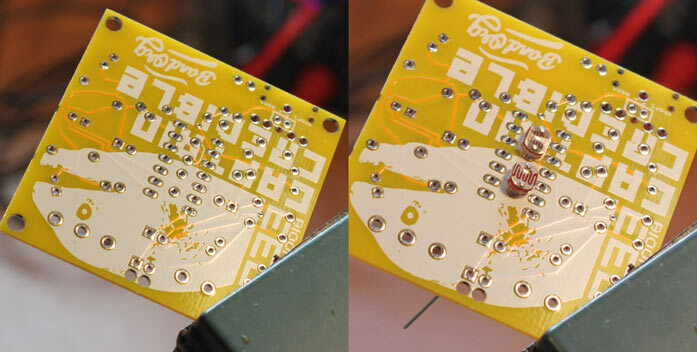 likewise the places where they go have 1uf printed on the PCB. 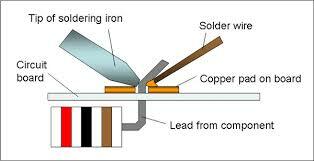 Because they are electrolytic it is important that they go in the right way. Note that one of the capacitor holes (the one directly above the IC) is for a bigger 1000uF capacitor, well get to that one later. I added a lot of arrows showing where it goes to make it even easier, you can not fail! Again, ignore the fact that it says 220ohms, your Blooper Eel is much more likely to live a long and healthy life with two 1kohm resistors here! This wants to be fed up through the holes from the bottom of the board before sticking the ends back down and soldering. this is so they dont come off so easily when they get tugged. Solder it in place (solder on the underside of the board)like all the other components. 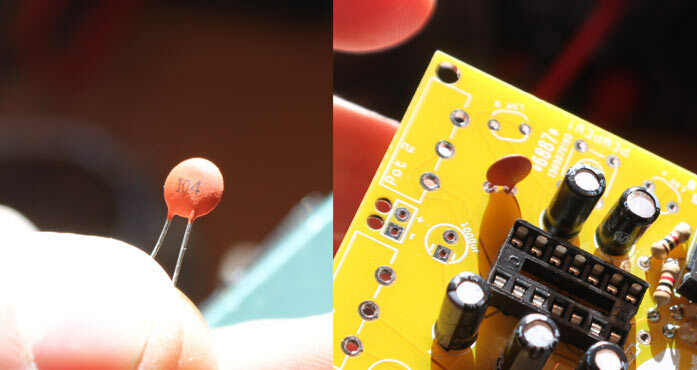 What is a potentiometer? here is what it is. 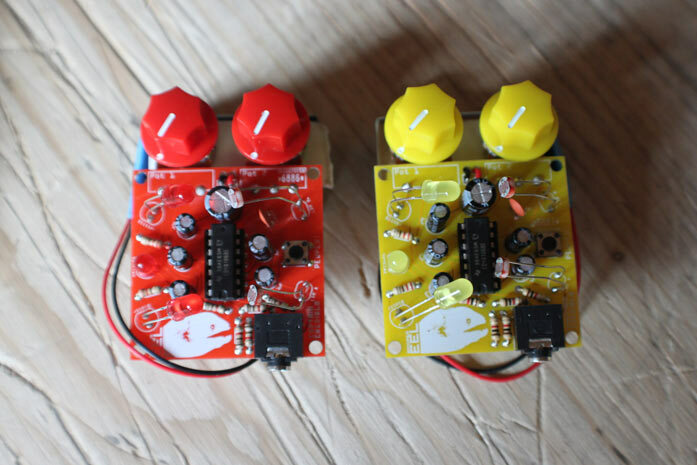 We need to show out potentiometers who’s boss by benting its legs backwards. and yes, solder all the legs on. 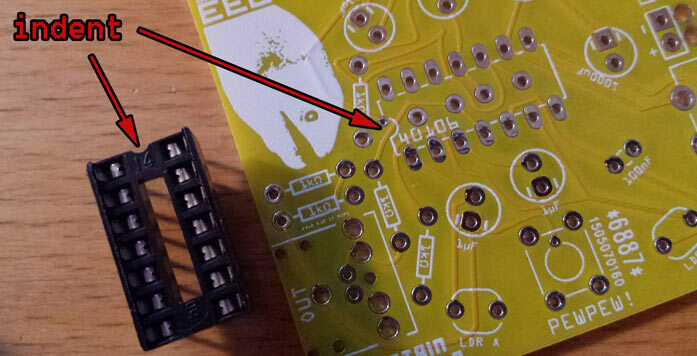 Aaaand this is when i realized i had missed a resistor heh… happens to the best of us. WTF are Light dependent resistors? they’re resistors, that vary with light, thats what they are. Some people call them photocells, whatever. Anyway we arent going to push these all the way through the board, instead we are going to balance them a tiny bit through the holes and then solder. I thought it was easier to solder these from the top, because i ‘m a rebel. Theres two of them on the top of the board, solder them both before it’s too late. LDRs are not “polarized” that means it doesnt matter what way round we solder them. 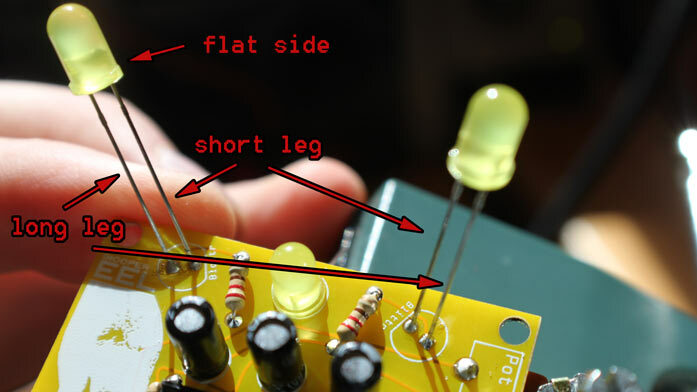 the short leg is the negative leg (cathode) and wants to go through the hole next to the flat edge on the symbol on the board. 12. 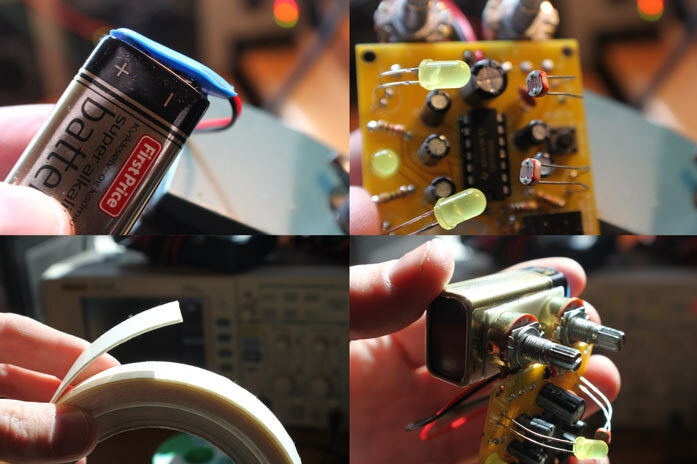 Slam dunk that 40106 hex schmidt trigger inverter into that sweet IC socket, awwwwww yiss! this one looks good to go looks good to go. So lets carefully straighten the legs against a table or something hard, make them point more or less straight down . Now push it carefully in to the socket, the indent is there to tell you what way round it should be. If you put it in upsidedown it will probably break. Is there anything connected or touching that shouldnt be ? solder spilled between legs on components? or lets that are touching eachother? If you shortcircuit your LDRs or your LEDs like this they wont work, it wont break anything though so just bend them apart and be on with your merry blooping. 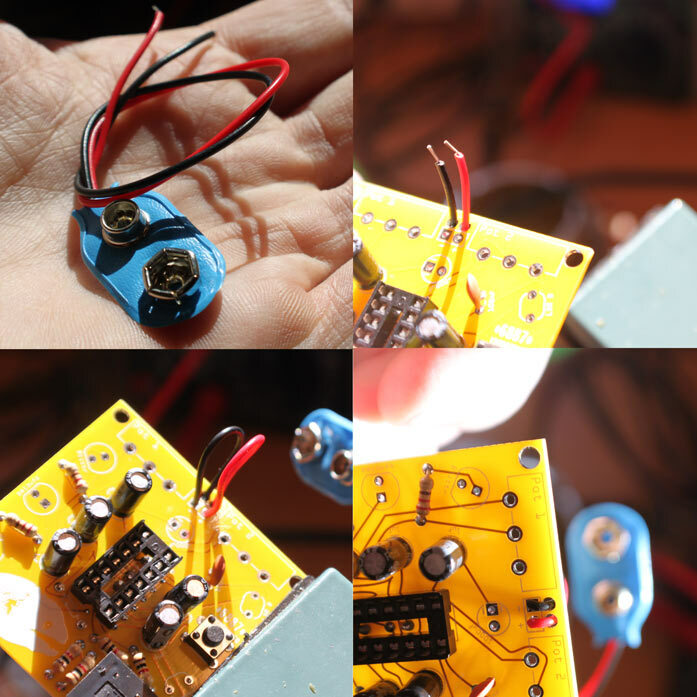 Connect the battery, bend the LDRs and the LEDs towards eachother, stick the battery to the back of the potentiometers with double sided tape. Easy. now pimp it up with some sick knobs, use a screwdriver to tighten them on if your knobs are the type that like that. 15. Plug in your headphones/speaker/Public announcement system and press the button marked PEWPEW! to instantly melt your face of in an epic climax of sheer awesomeness! This time the title really does say it all, do what the title says! look at your baby, isn’t it beautiful?